I've finished hand quilting and binding my Little Goose baby quilt. I love that moment of pulling it out of the wash and hanging it up to take a good look. 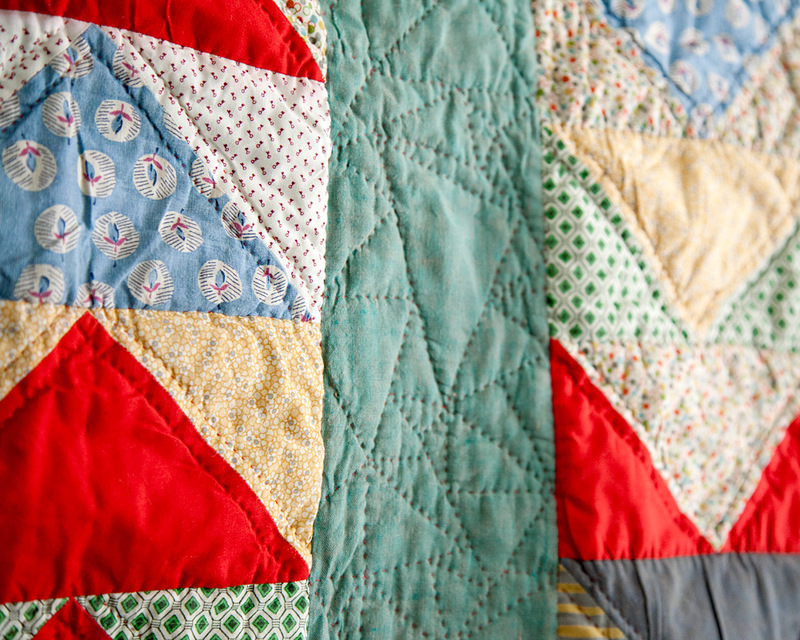 The dusty blue, red and white vintage feed sack print remains to be the real star of this quilt. It's the quilting really that was my concentration for this quilt. Usually I'll quilt repeated lines, shadow the pieced shapes, or when I'm making freehand patterns I usually enjoy stitching curved shapes. Curves had no place in this quilt, so I figured out a way to make the tiny freehand, improvisational triangles. One of the real things that distinguishes hand quilting from machine quilting is that hand quilting does not require continuous line patterns to be neat and tidy. A pattern like this would never work on the machine, so it was fun to think of the impossibility of stitching the lines any other way as I went along. This stitch pattern particularly relies on the staggering of corners and triangle sizes to preserve the randomness, and so that asterisk shapes do not emerge too frequently in the pattern. It's actually a lot more difficult to be random than you'd think. We all have a natural tendency toward order in making, and even in efforts of randomness like this I still find myself making rules about where the lines can or cannot be stitched. You can find this quilt available in my shop if your love of triangles matches mine. I hope it will keep some pint sized person very cozy.